Plimoth Plantation gives you a look at how the Pilgrims lived in 1627, shortly after they arrived. Plymouth's other historic houses show you how New England architecture evolved over the next two centuries. 42 Summer Street, was built in 1640, and is the oldest house in Plymouth. In 2000 it celebrated its 360th anniversary. The house overlooks Town Brook Park, and there is a craft gallery with pottery made on the premises. The gallery stays open through Christmas, so you can pick up some Plymouth crafts as holiday presents. 33 Sandwich Street, south of the town center on the way to Plimoth Plantation, dates from 1667 and is the only Plymouth house still standing that was known to have been occupied by Pilgrims. The parents of Jabez Howland, builder of the house, came over on the Mayflower, and it's presumed that they spent their last years here with their son. 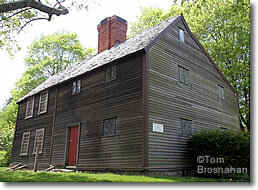 119 Sandwich Street, has hand hewn beams from the Pilgrims' log fort on Burial Hill. Built in 1677, the house is now occupied by costumed guides who demonstrate 17th-century crafts and conduct tours. 27 North Street, just up the hill from Plymouth Rock, was built in 1749, and used to be the home of the Spooner family, famous through the Plymouth Cordage Company as the world's largest maker of rope and twine. James Spooner, last of the family to live here, died in 1954. 126 Water Street, is a handsome Federal-style structure built by a wealthy shipowner in 1809 and furnished with precious objects brought home by his ships. The fully equipped 19th-century kitchen is a treat. 4 Winslow Street, just up the hill from Plymouth Rock facing the Spooner House, was once the elegant home of Edward Winslow. Part of the house was built in 1754, and the other part in 1898. Besides the furnishings, a primary attraction is a daring, flying staircase which looks as though it really should fall down, but doesn't. Above, Howland House (1667), where Pilgrims once lived, Plymouth MA. 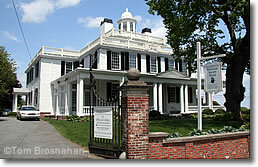 Below, the Mayflower Society keeps track of Mayflower descendants from its headquarters in the elegant Winslow House (1754, 1898).